Lately I’ve been daydreaming about the beach. A lot. This is likely due to the fact that very soon I’ll be lounging on a beach in the Caribbean without a care in the world. 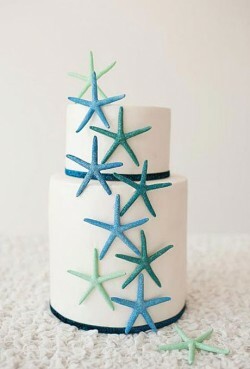 But it also got me thinking about beach-themed wedding cakes since it is the perfect time of year for a beach wedding. It’s Shark Week this week on Discovery Channel. Which means I’m thinking about the beach and how it’s probably best to stay ON the beach and out of the water. 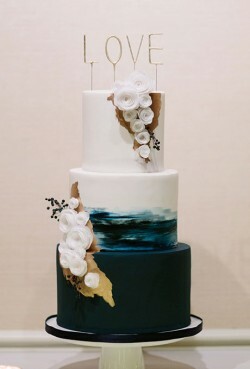 So, instead of swimming in the ocean let’s look at this lovely wedding cake that was inspired by the waves in the Big Blue! Having just returned from a week at the beach I’m still daydreaming about the sand and surf so I just had to share a beach-y wedding cake today! 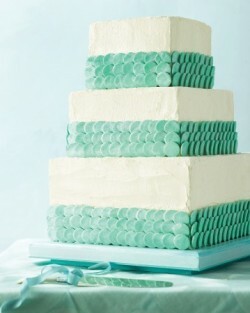 And I’m loving the look of this modern beach-inspired cake. Not only does the cake feature lovely seashells as embellishments, but will you look at those ‘waves’ on the icing? 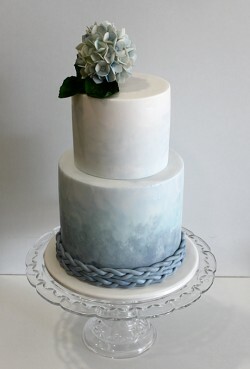 It’s almost too pretty to eat. As we slowly inch closer and closer to summer it means we’re getting that much closer to beach season too. 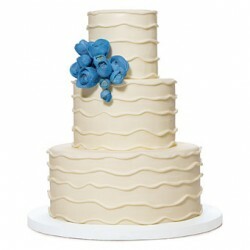 And that means beach weddings and wedding cakes the remind us of the beach. As the East Coast is snowed in today and I’m seeing more winter weather in my local forecast I’m finding myself daydreaming more every day about my summer beach vacation. 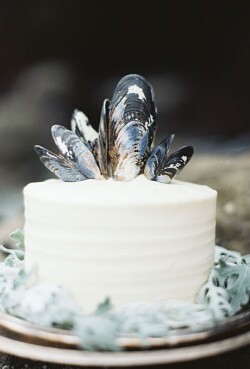 And these daydreams of sand and surf made me think about summer beach weddings. 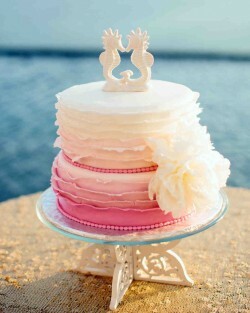 Which of course brings us to today’s wedding cake. As winter continues its relentless grip on most of the country I have decided it’s time to dream about summer and beach weddings. Which brings me to today’s nautical, beach-inspired wedding cake. Don’t you feel warmer just looking at this cake? 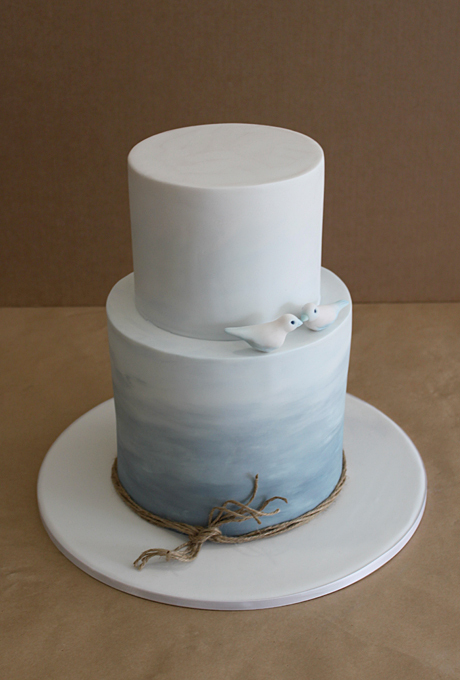 I can almost imagine the beach wedding, right on the sand, with the sun shining down. So, let’s dream about a destination wedding in a warm, tropical, and beach-y location. 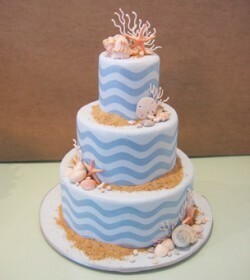 And at this wedding your theme is seashells. 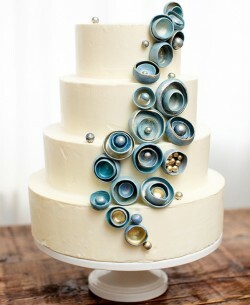 Lots and lots of seashells. And this gorgeous one-tier cake is your beach-inspired, seashell-topped wedding cake.